Known for its impressive skyline, beautiful natural harbour, exciting nightlife, and frequently hailed as the culinary capital of Asia, more and more visitors are falling in love with Hong Kong, hoping to taste the Asian experience without the hassle of too much immigration and visa requirements. In 2015 alone, Hong Kong welcomed more than 5 million people. With various tourist spots to visit, it’s almost impossible to think that you can enjoy all of these destinations in a short stay. What if you only have two days to spend in Hong Kong? Will you get to enjoy most of what the country can offer in a short period of time? Here’s a post how you can make the most of your stay in Hong Kong with only two days to stay. Your trip to Hong Kong will never be complete without trying their traditional food. The safest to take will be the known Cantonese breakfast, Dim Sum. Anywhere you go, you can easily find a Dim Sum place or a restaurant that offer such. Dim Sum comes in various tastes: hot or cold, steamed or deep-fried, sweet, salty, and sour. The most popular Dim Sums include Shumai, steamed rice rolls, Cha Shao Bao (sweet barbeque pork buns), and the spring rolls. Try some of the suggested Dim Sum place by lady iron chef in Hong Kong to get the most authentic and delicious Dim Sum taste. Amongst all the attractions in the country, the must-try is the Star Ferry and the Ding Ding Tram. For those staying in the Kowloon, Hong Hum, and Mongkok side, take the Star Ferry to cross Victoria Harbour. The fare is only HK$ 2.5 on weekdays and HK$ 3.4 on weekends. 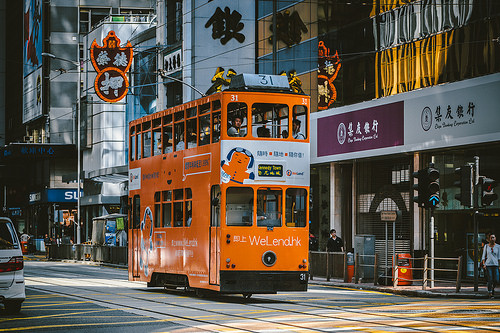 Another iconic mode of transportation is The Tram, which is the cheapest way to get around Hong Kong Island (only HK$ 2.3 per ride no matter where you go). The entrance is at the back. It’s best to prepare the exact change or use an Octopus Card and pay the driver at the front door upon exiting. But, just in case you insist in renting a car while in HK, consider signing up for a travel insurance. You’ll never know when an accident will strike, so to avoid the pain and hassle of covering any excessive expense on your trip, get insured before you leave. According to the information shared by this travel policy resource, excessive cost for rental vehicle can be as much as $7,000. Any legal liabilities will also cover the policy holder up to at least $2 million. So, if you want to stay safe, try the local transportation instead and experience how the locals go around the city easily. Giving you the perfect sight of Hong Kong from the top, the Victoria Peak or popularly known as The Peak is the most famous location to enjoy the skyline of Hong Kong at day and at night. Riding the Peak Tram will take you to the destination, which will only take about seven minutes. It’s best to take the right side of the tram to get the beautiful sight uphill, such as the Hong Kong skyscraper and the Victoria Harbour. There is a shopping mall with restaurant in the area called the Peak Galleria and places to get souvenirs. There are plenty of other places you can include in your trip, such as trying a roasted peking duck, watching the Symphony of Lights at night, and visiting the Avenue of Stars. But, the ones listed above is a must-try for every new visitor in Hong Kong. I want to go to Hong Kong!